Bride and groom on the pier outside Lighthouse Restaurant. 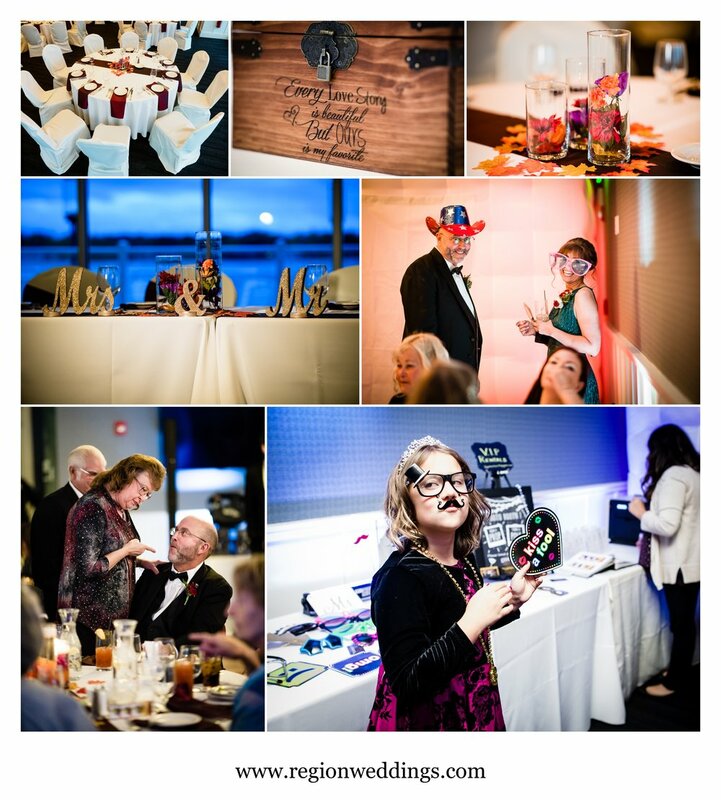 Katie and Mike's Fall wedding at Lighthouse Restaurant in Cedar Lake, Indiana was an incredibly joyous affair with a chilly but brief outdoor ceremony, first look on the long pier and plenty of fun on the dance floor. We started out at Downtown Hair Studio and the off we went to bridal suite on the second floor loft of the Lighthouse. Katie's jewelry really popped against the colors of her Fall decor. Bridal prep for a Fall wedding at Lighthouse Restaurant. The bride gets ready in the second floor loft of Lighthouse Restaurant. Bride and groom first looks / reveals are always great moments and Katie's and Mike's was no exception. Keep in mind that temperatures had fallen into the 40's at this point with quite a bit of wind whipping up the lake water. Katie didn't let Mike wait out there too long and they both warmed each other up with a kiss. First look for the bride and groom on the pier at Lighthouse Restaurant. I took turns taking the wedding party outside for pictures. It may not have been sunny, but the EPIC, SWAG, LOVE glasses were on display anyway!! 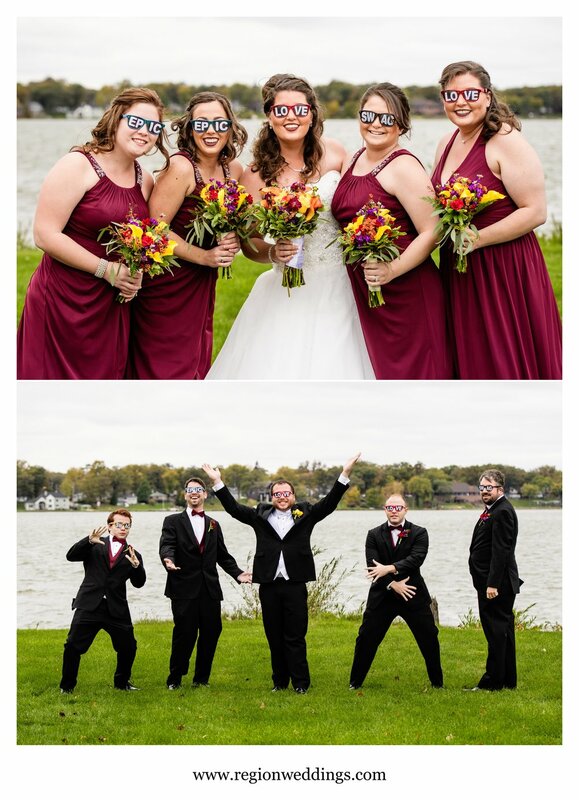 Fun wedding party photos with sunglasses. Fall color is definitely here now and we incorporated that into our images along with the lake tide splashing up onto the boradwalk. 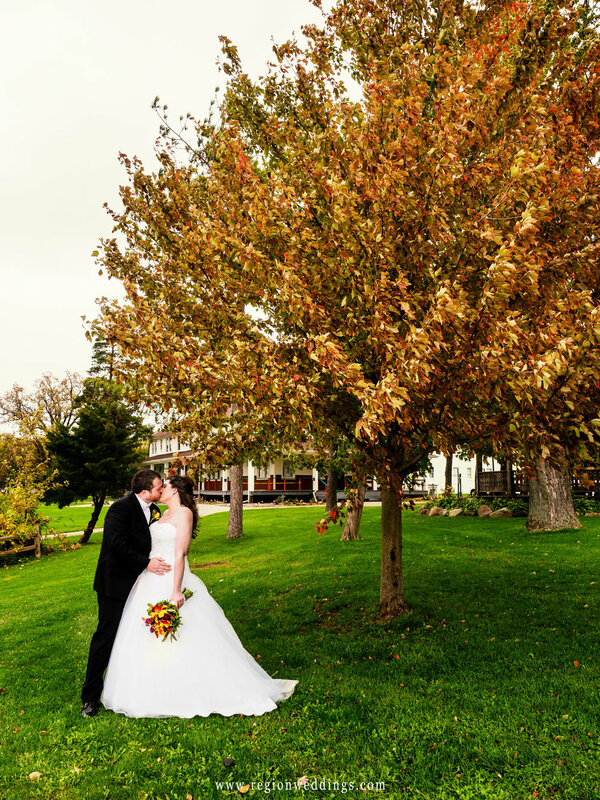 A large tree with yellow Fall leaves looms over the bride and groom. 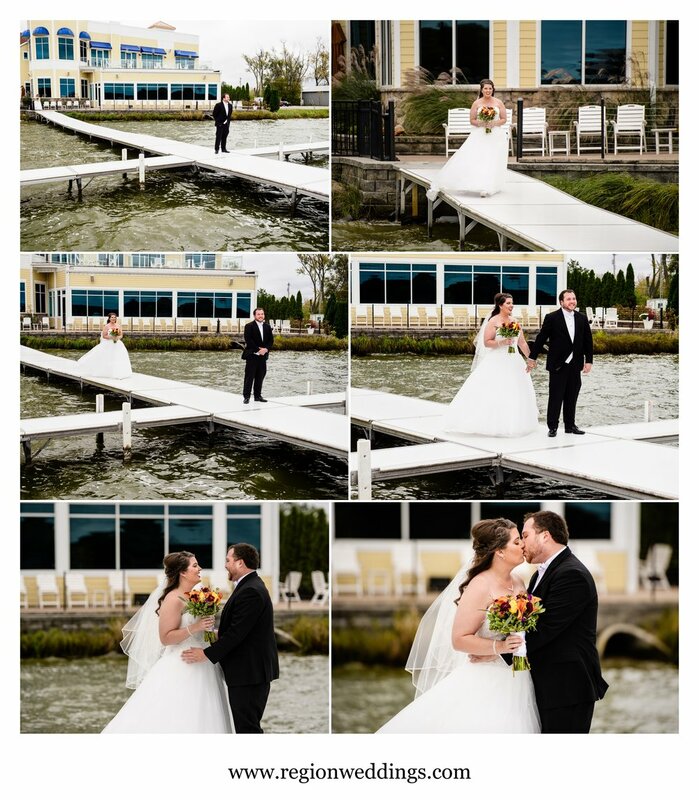 Wedding photos along Cedar Lake by Lighthouse Restaurant. Bride and groom take a walk along the boardwalk of Cedar Lake. The bride lakeside with storm clouds on the horizon. The groom at his Fall wedding at Lighthouse Restaurant. We finished up the wedding party and family photos and then it was time for our outdoor ceremony at the gazebo. Wedding party at Lighthouse Restaurant in Cedar Lake, Indiana. Katie said she wanted her ceremony to be quick. It was now 36 degrees outside. She got her wish!! The wedding party filed in, officiant Kelly said some wonderful words, rings were exchanged and 8 minutes later, Katie and Mike kissed!!! Outdoor Fall wedding ceremony at Lighthouse restaurant gazebo. 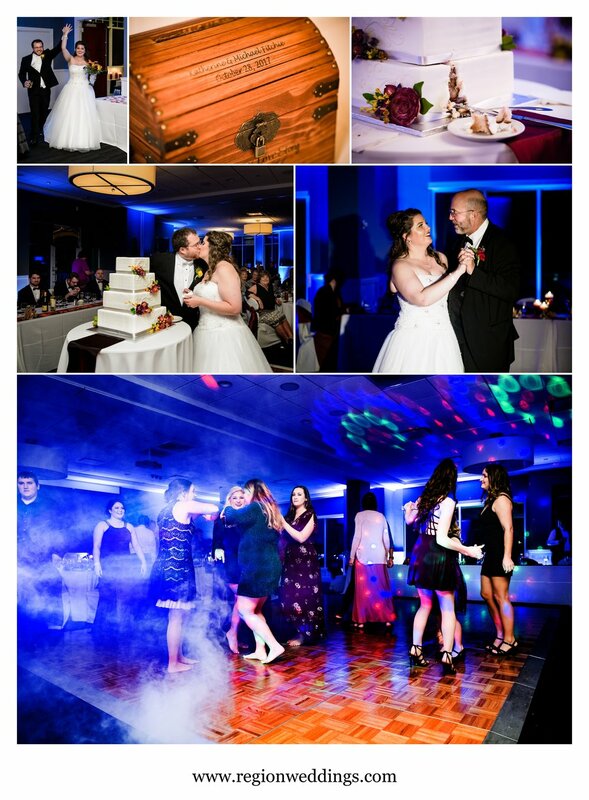 The photo booth fun started early and after dinner first dances began. It was alive all night with all ages singing and getting down. Reception fun at a Fall wedding in Cedar Lake. 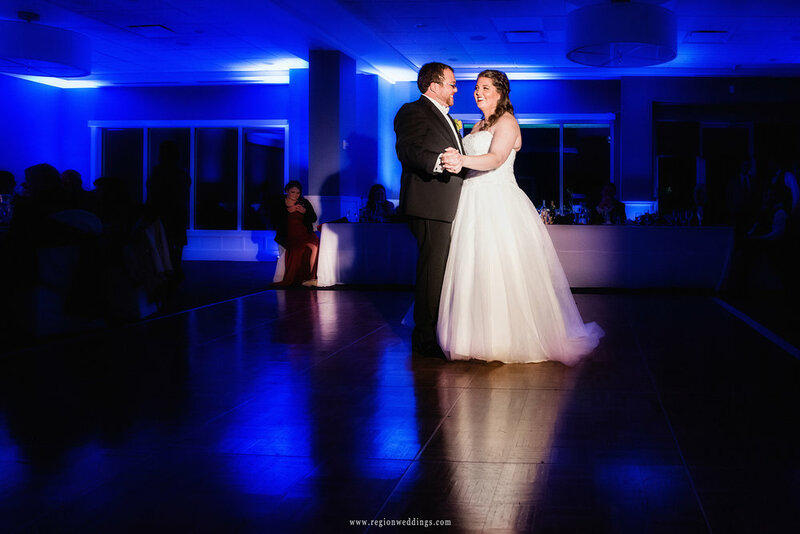 First dance for the bride and groom at Lighthouse Restaurant. Smoke fills the dance floor at Lighthouse Restaurant ballroom. If you are planning your own wedding be sure to fill out the Contact Form to discuss photography for your big day. 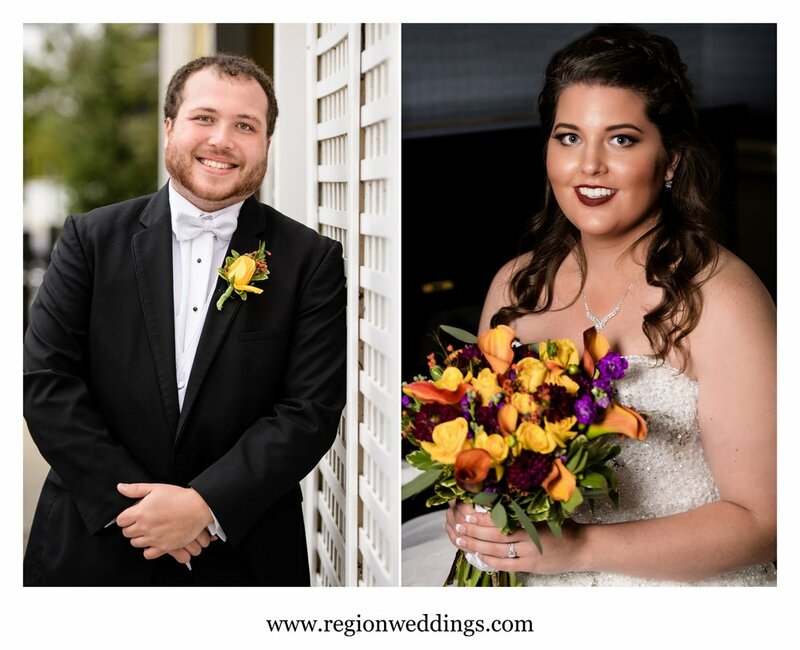 To see more images from this and other weddings, please follow the social media channels below.